Today’s global challenges – such as a chronically low growth and unequal economy, disruptive new technologies and, on a more fundamental level, the search for identity – require a new set of skills from our leaders. Specifically, they require the ability to democratize the political process, to empower others, without absolving themselves of responsibility. This is where “systems leadership” comes in. Based on the notion that complex problems cannot be solved from a single perspective alone, this type of leadership requires a willingness to include a vast and diverse range of interest groups in the decision-making process. It takes an understanding of the big picture – of the “system” – and an aspiration to create, not just react to, changes. But as much as systems leaders empower and include individuals – engaging them in decision-making processes, opening up access to new technologies and basic goods – they still take ultimate responsibility for the decisions that affect society as a whole. How do we democratize decision-making? Increasing the engagement of citizens in the policy-making process, beyond the current forms of privileged engagement with organized interests and lobbying, would enable citizens to develop a sense of ownership and get a better understanding of the complexities and trade-offs of public challenges, says Professor Alberto Alemanno, a proponent of deliberative democracy and founder of the Good Lobby , an organization that connects skilled citizens with NGOs, elected representatives and public administrations. Other means to democratize the policy-making process include social media and digital gamification, and on the local level consultation processes with all stakeholders affected by a decision. Another way to enhance citizen representation is to democratize access to political parties by seeking citizens with different, non-political and unconventional backgrounds. However empowered individuals are, they still expect their governments to be in control of critical events, such as the refugee crisis or the financial crash, two triggers of rising populism in Europe. Sometimes it means that leaders need to sacrifice responsiveness to an explicit citizen demand (e.g. a cap on refugees) in favour of responding to an underlying need (e.g. to live in safety) while keeping an eye on the bigger picture (e.g. solidarity with refugees, a diverse society, the reasons for migration). Maybe the biggest task for leaders is to figure out what holds society together in times of crisis, especially in a world of increased polarization. In a democracy, if the electorate is engaged in a participatory process before a decision is taken, leaders wouldn’t need to legitimize and delegate their decisions and, ultimately, their leadership. They wouldn’t need to outsource their responsibility by holding a referendum, for instance. The way forward seems to be a participatory process combined with a visionary, long-term-oriented and courageous leader; one who involves all perspectives in the decision, decides and takes full responsibility for the outcome. Empowering individuals also means democratizing access to technology. One example lies in the security sector. Jean-Marie Guéhenno, president and chief executive officer of the International Crisis Group , is promoting a decentralized security system . Many people fear uncontrolled access to new technologies, but Guéhenno thinks that the world is made a safer place by allowing public access to technology – namely to full, and ideally unbreakable, encryption technology and firewalls. One of his main arguments is that in the cyberworld, attack is cheaper than defence, so democratizing unbreakable encryption technology ultimately serves the majority. 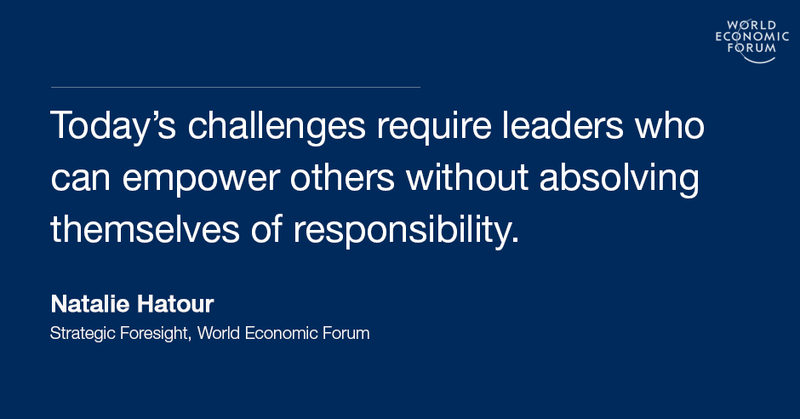 Democratizing access doesn’t free leaders from further responsibility. Real security has its origins in strong communities where people have a basic sense of belonging and where stories are told that foster empathy not fear and that are inclusive not exclusive. Thus, the responsibility of a leader – for example, a city mayor – is to create that sense of belonging, says Guéhenno. An example of democratized access to basic goods is a basic income for all, promoted by Guy Standing , Research Professor in Development Studies at the University of London and author of The Precariat . He argues that basic income gives people economic security in a period of chronic insecurity; it can empower individuals to pursue their contribution for society without the pressure of survival. A leader’s responsibility, on the other hand, is to make sure that such an economic system is feasible and effective on a large scale. The peace process in Colombia is an example of how complex it can be to combine individual empowerment with visionary leadership. President Juan Manuel Santos initiated the negotiations that culminated in the peace accord between the Colombian government and the FARC guerrillas. He held a referendum to legitimize the accord - which raises questions. The outcome of the vote was not what he wanted, however: a narrow majority of the over 13 million Colombians said no to the accord. The fact that Santos is now inviting all parties to participate in a broad national dialogue aimed at advancing the peace process is significant, and not something that has been missed by the Norwegian Nobel Committee . We need to empower individuals by democratizing access to decision-making processes and dialogues, political parties, technology – and also potentially to a basic income. Outsourcing decisions, on the other hand, is the opposite of responsible leadership.